Jenny Chio is a cultural anthropologist and ethnographic filmmaker. Currently, she is Assistant Professor of Anthropology and associated faculty in Film and Media Studies at Emory University. Her research and teaching interests focus on culture and society in China; contemporary rural livelihoods; tourism, identity, and forms of cultural representation; and documentary image studies. She has conducted fieldwork in the villages of Ping’an and Upper Jidao in southwestern China since 2006, with a particular emphasis on exploring the impact of tourism on intra-village social relations, individual conceptualizations of self, and local understandings of travel and modernity. A book-length study based on her long-term fieldwork, titled A Landscape of Travel: The Work of Tourism in Rural Ethnic China, is forthcoming in 2014 from the University of Washington Press in the series Studies on Ethnic Groups in China. In this book, she examines in detail the experience and consequences of tourism for village residents as well as their changing perspectives on development, modernization, and ethnic identity in the context of contemporary Chinese society. Additional scholarly publications exploring tourism and its consequences in rural China include essays in Identities: Global Studies of Culture and Power (18:6, 2011) and in the edited volumes Cultural Heritage Politics in China (Springer, 2013) and Asia on Tour: Exploring the Rise of Asian Tourism (Routledge, 2009). She is also committed to exploring visual research methods in anthropology and has written on this in the volume Fieldwork in Tourism: Methods, Issues, Reflections (Routledge, 2011). She made a short film on the representation of ethnic minorities in Chinese ethnographic films from the 1950s and ’60s, titled Film the People. More recently, her work considers the relationships between documentary media production and social transformation in China. She is particularly interested in contemporary practices of videography in rural Guizhou and Yunnan provinces and in ethnographically exploring the epistemological relationship between “media literacy” and modernization. Her recent publications on this research include a chapter on “village videos” in the volume Mapping Media in China: Region, Province, Locality (Routledge 2012), which she co-edited with Wanning Sun, and an article on the 2011 Yunnan Multi Culture Visual Festival, co-authored with Luke Robinson (Journal of Chinese Cinemas, 7:1, 2013). Further details on Jenny Chio’s research, teaching, publications, and films can be found on her web site (http://www.jennychio.com) and the Emory University Dept. of Anthropology website (http://www.anthropology.emory.edu). This colorful, entertaining, gently ironic documentary presents a vivid and sensitive portrait of a side of China that is little known outside the country: the world of ethnic tourism. In recent years, hundreds of millions of Chinese tourists, mostly city-dwellers, have used their newly increased incomes to travel. 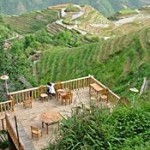 And many of the places they visit are ethnic minority villages in China’s West and Southwest.